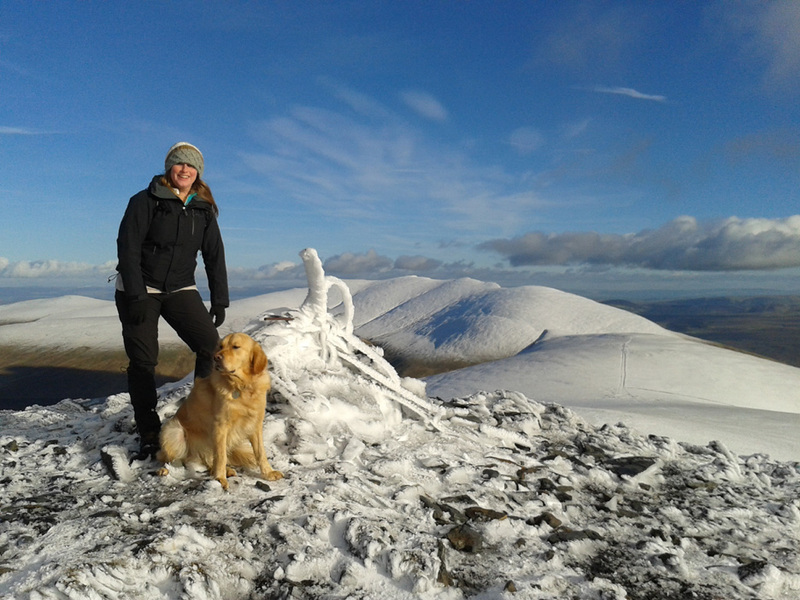 " Skiddaw under Snow with Jenna "
Date & start time: Wednesday 10 th February 2016, a midday start. 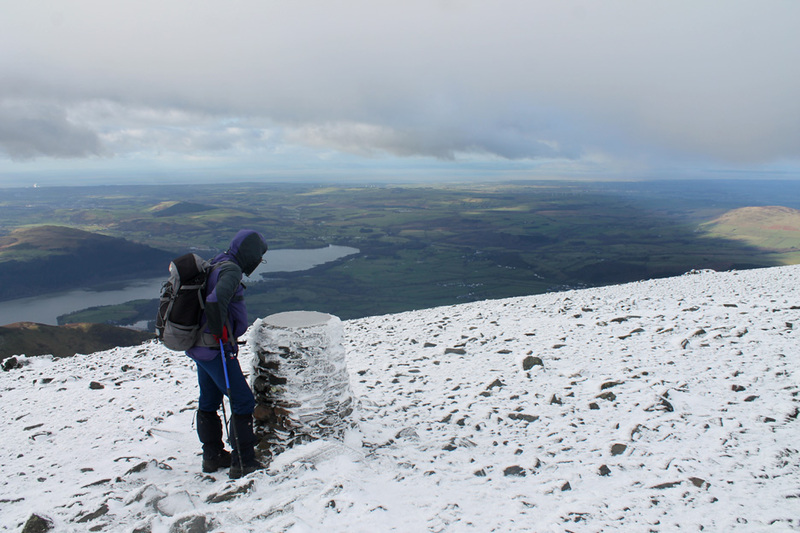 Places visited : Jenkin Hill, Skiddaw, Skiddaw Little Man and back. Walk details : 6.8 mls, 2750 feet of ascent, 3 hour 30 mins. Walked with : Ann has Harry on the first walk. Jenna and I take Dylan on an alternative walk. Weather : Beautiful blue sky, winter weather with occasional passing clouds. 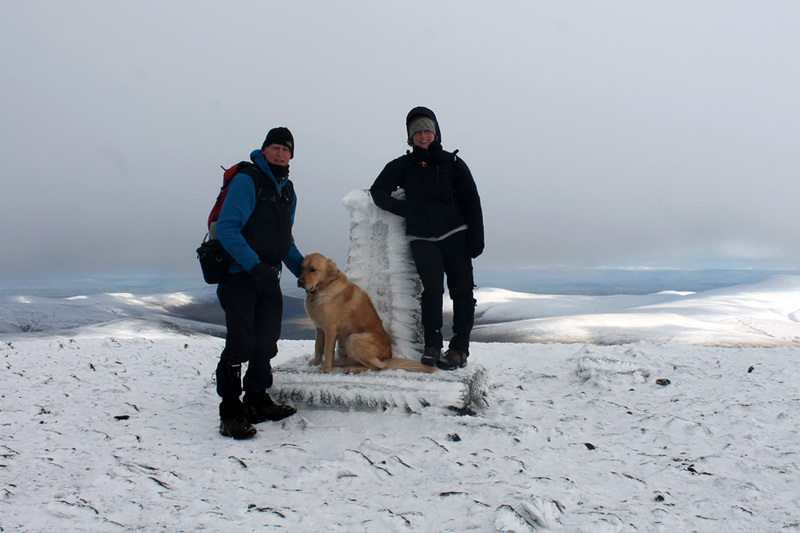 With our daughter requesting a snowy walk on a high fell we split resources today. 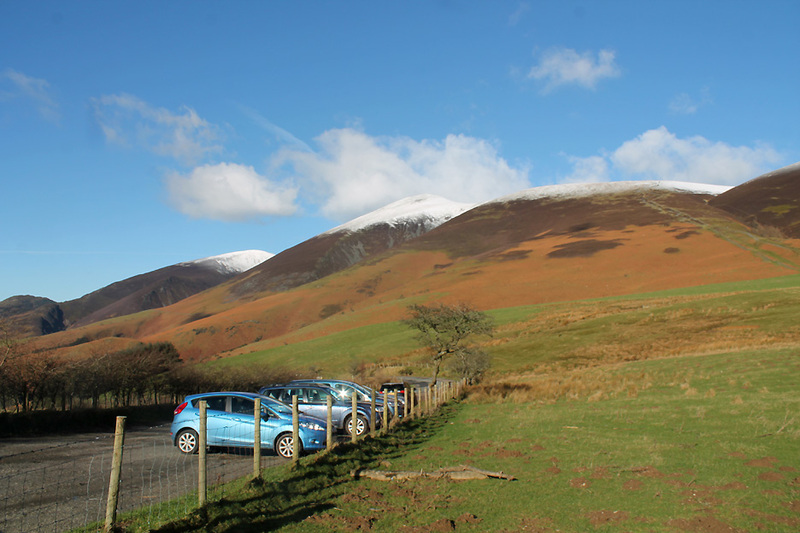 whilst Jenna and I take the second car over Whinlatter Pass towards Keswick. First a few photos from Ann . . .
Jenna and Roger have taken the opportunity to walk over there . 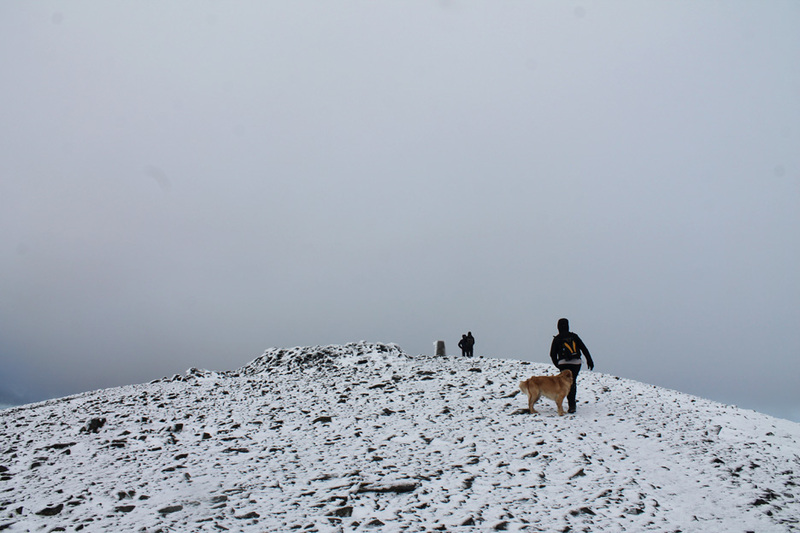 . . on Skiddaw. 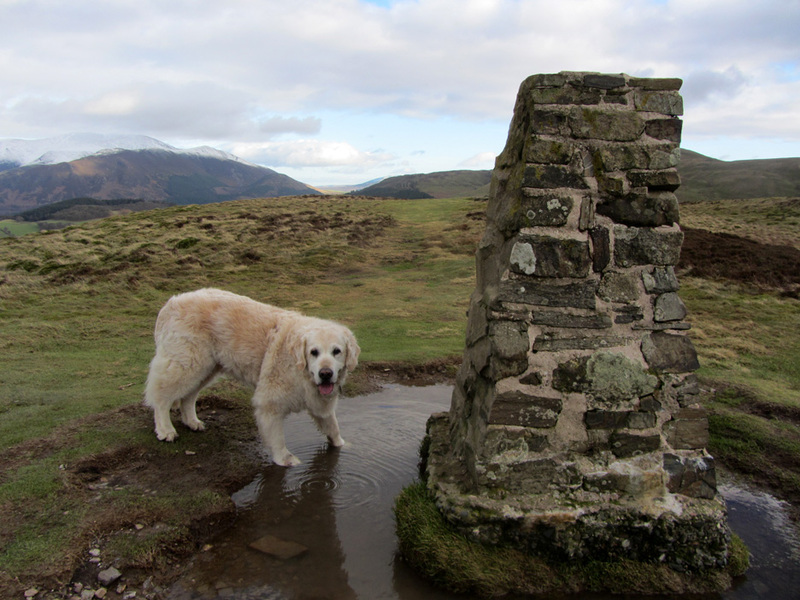 Harry and I are walking Ling Fell . . . looking down on Embleton and away to left, Cockermouth. 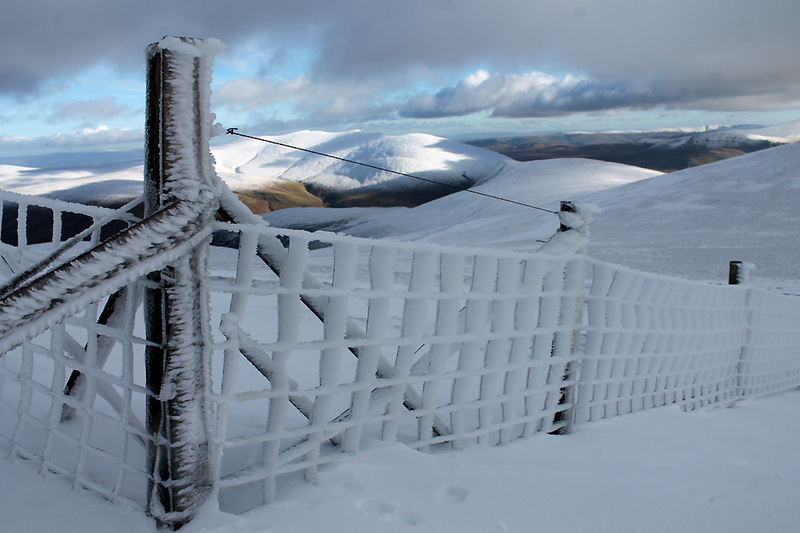 Visibility is good today and the views extend all the way over to Scotland. Dipping his feet in the summit puddle . . and having a drink. Me and my mum . . . a selfie ! Meanwhile . . . at the other end of Ann's first picture. . . Jenna and I have driven over to the Gale Road car park. Parking is easy here today, not because of the lack of people but due to the fact they've posted road closed notices further down. They've repaired the road surface half way up but the road above has suffered badly from the recent rains. We drove up quite prepared to reverse back down . . . but there was no need and we join other intrepid travellers who have done the same. It is half-term week for Jen . . . she's working in a Yorkshire school and her holiday week is earlier than Cumbria's. Their feet were on the living rock. Oh guide and bless them still." The weather and the conditions were beautiful today. 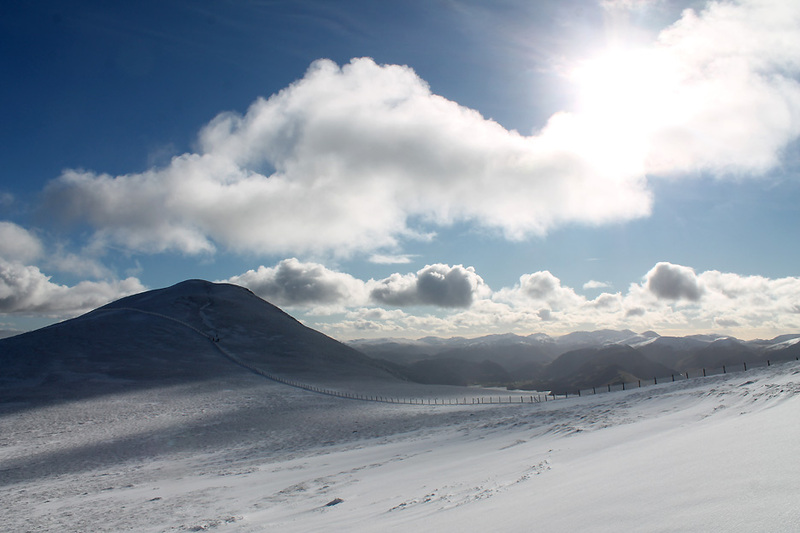 Blue skies and sunshine with snow on the tops and all the valley roads clear . . . a perfect combination. 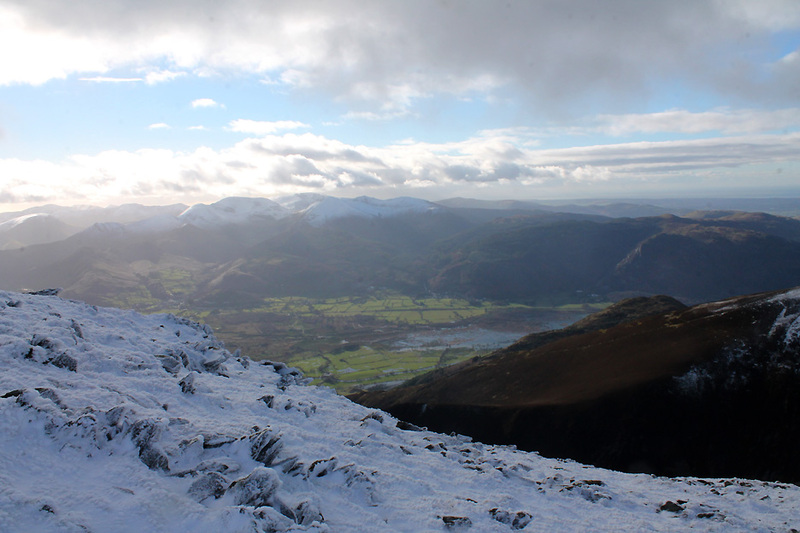 This is the view north west from the monument to the Ill Crag / Grisedale Pike area. 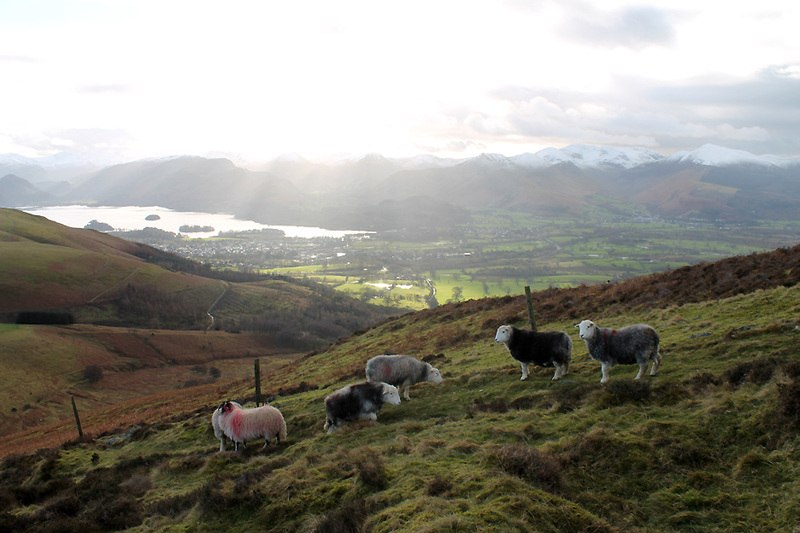 Looking across the slopes of Latrigg and down to Keswick and Derwent Water. We climb we past the first of three gates on the ascent to the summit. This route used to be called the Pony Track because in Victorian days you could hire a pony to carry you most, if not all of the way to the top. there was a small refreshment hut at this point, which accounts for the levelled area to the right of the gate. Hold your cursor over the picture to see the ghostly image from years gone by. On the steep part of the climb we pause . 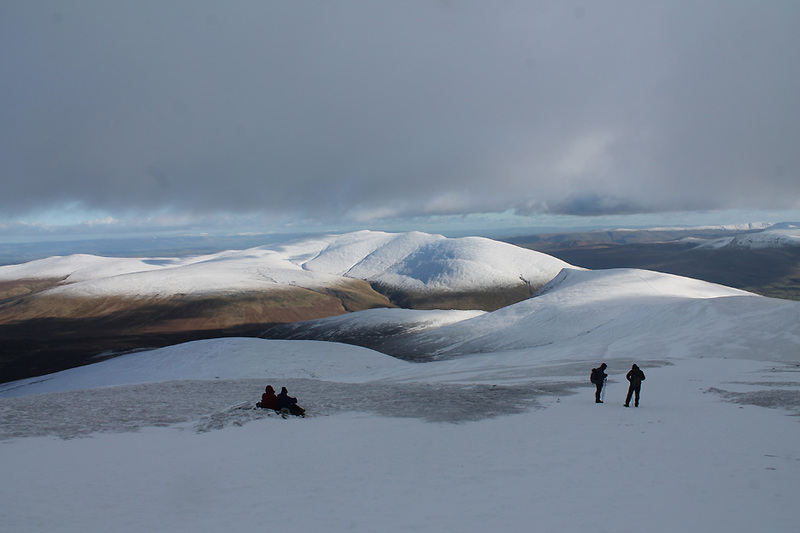 . . and enjoy the view across to the Helvellyn Range. 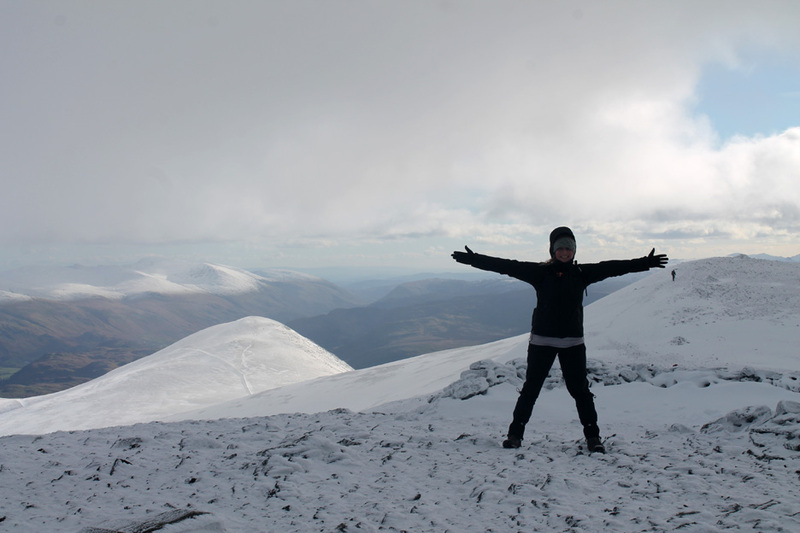 Officially above the snow line now as we use the excuse of a photo for another short rest. 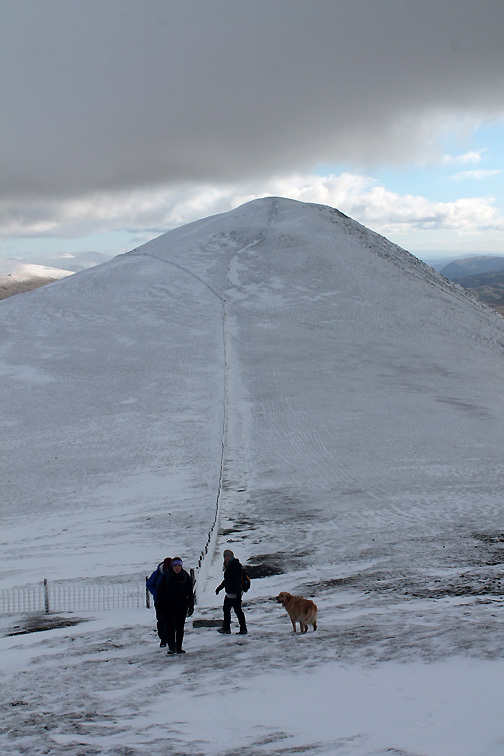 This route up Jenkin Hill towards Skiddaw is steep but has the satisfaction that you gain height quickly. 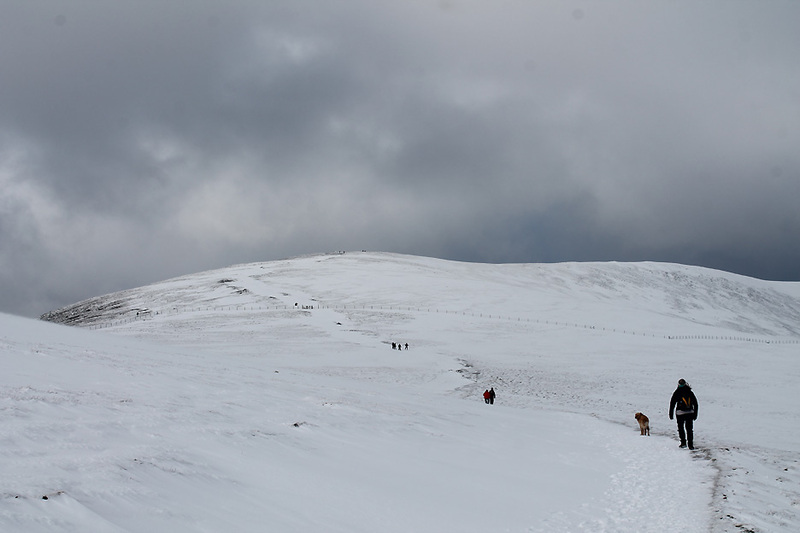 We must be nearing the top of this first climb as the slope has eased. Time for a photo for a photo's sake . . . no need for a rest now as it is easy walking once again. 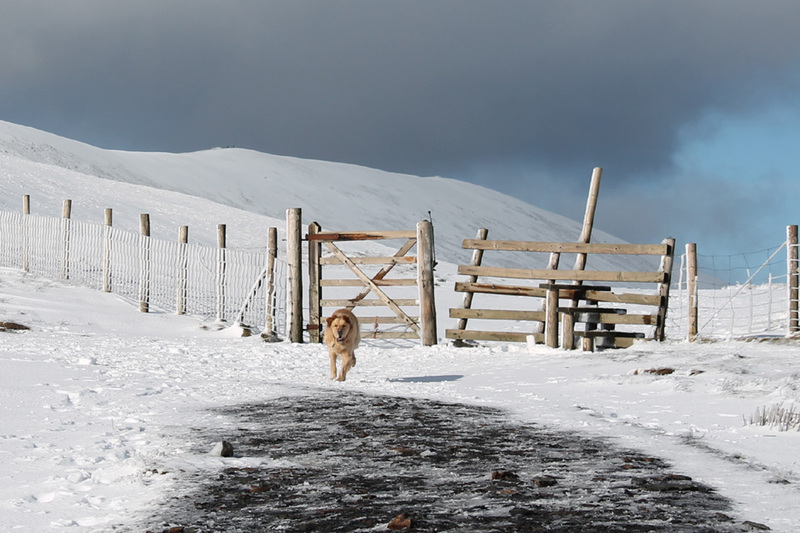 Dylan leads the way towards the gate on Jenkin Hill. The snow is deep on the right where it fills the gully. 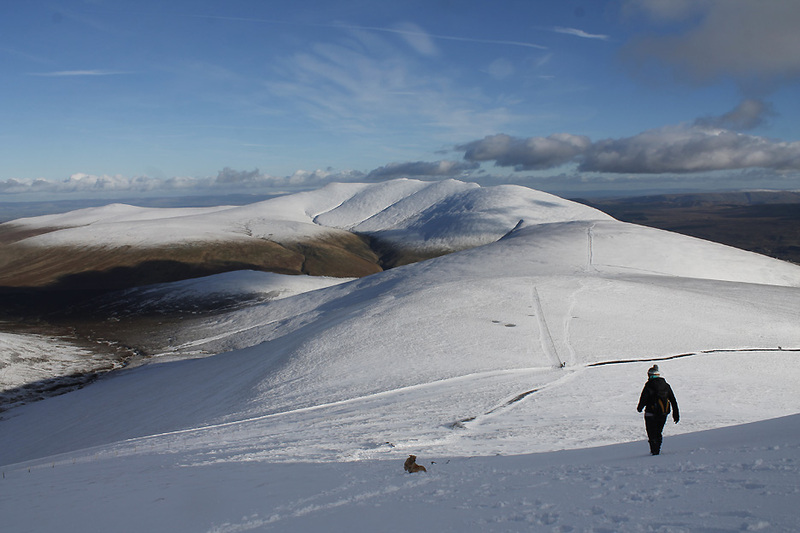 Ahead is Skiddaw Lesser Man in shadow with Little Man in sunshine. "I've been to the gate and you can get through !" 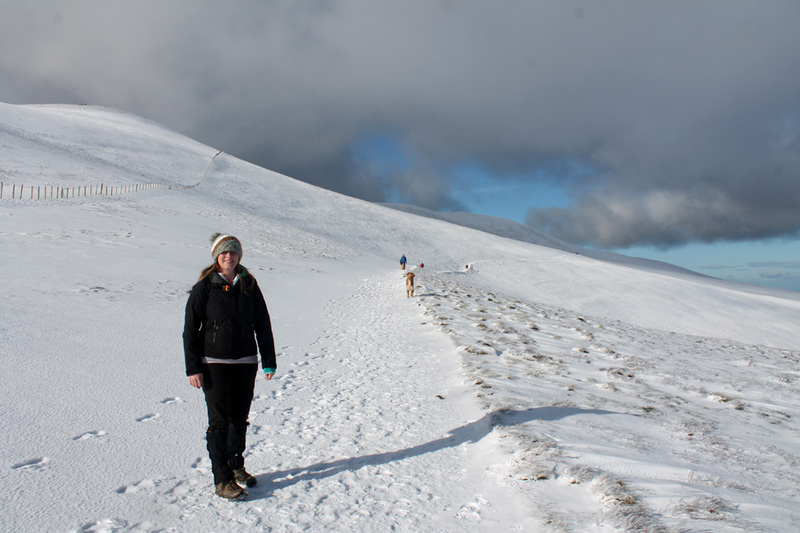 the snow covered path to the left taking you on the ascent to Skiddaw Lesser Man. For the walker there are few delights in fencing except that in the summer they provide easy navigation marks. In winter, after a cold spell with snow they take on a whole new persona as the ice builds up on the individual strands of wire. 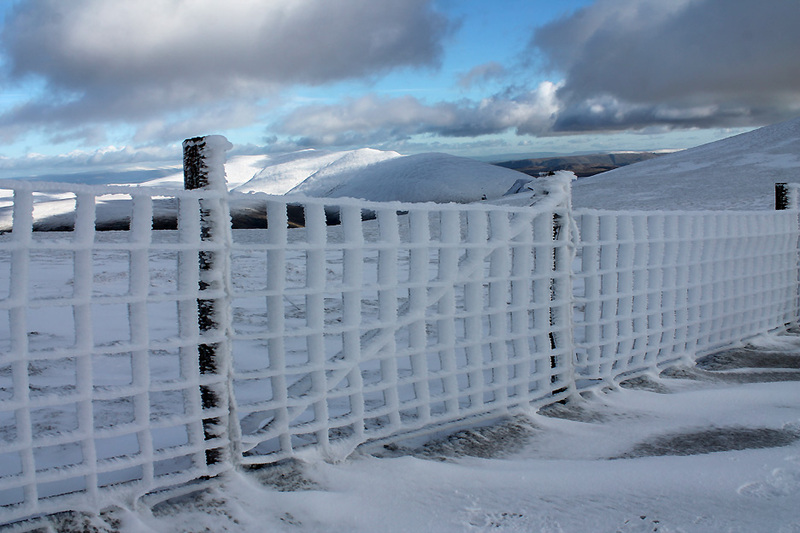 This is the fence leading out to Lonscale Fell . 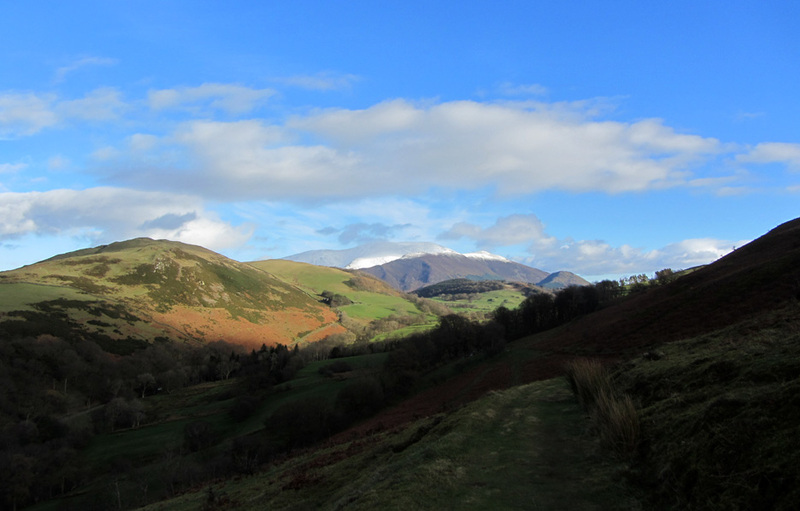 . . Blencathra in the distance lies beyond the deep Glenderaterra Valley. There's a grey-ish cloud building over the summit . 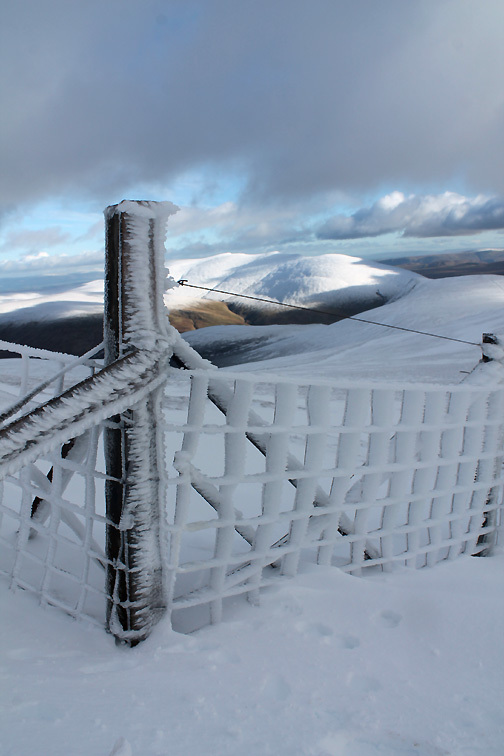 . .
Best take a panorama now from the top step of the stile while the sun shines. 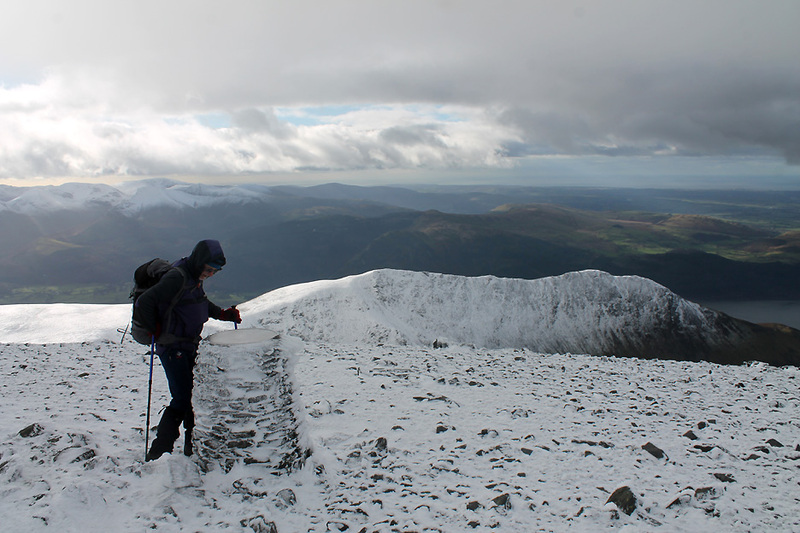 We'll defer on the two minor summits in favour of a direct ascent of Skiddaw itself. 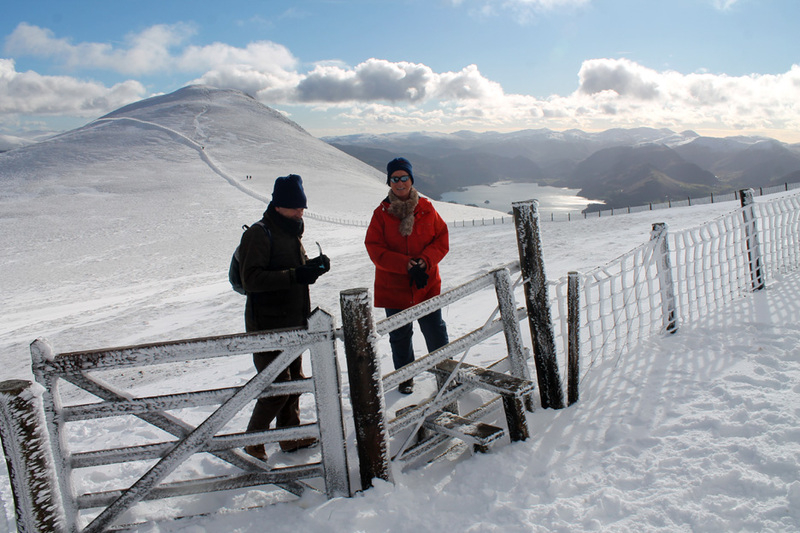 Hopefully it will remain fine and give us good views from those two on the way back down. Looking north east down the upper section of the Caldew Valley. 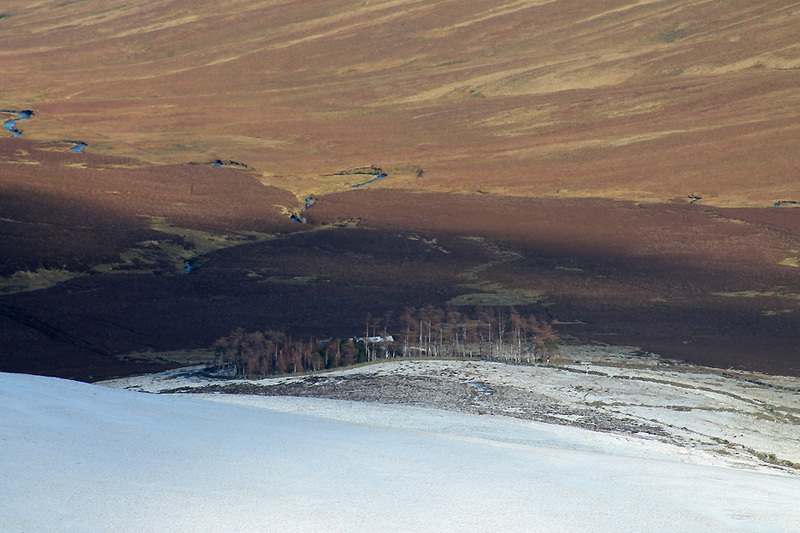 just about seen here by the trees on the snow line in the middle distance. 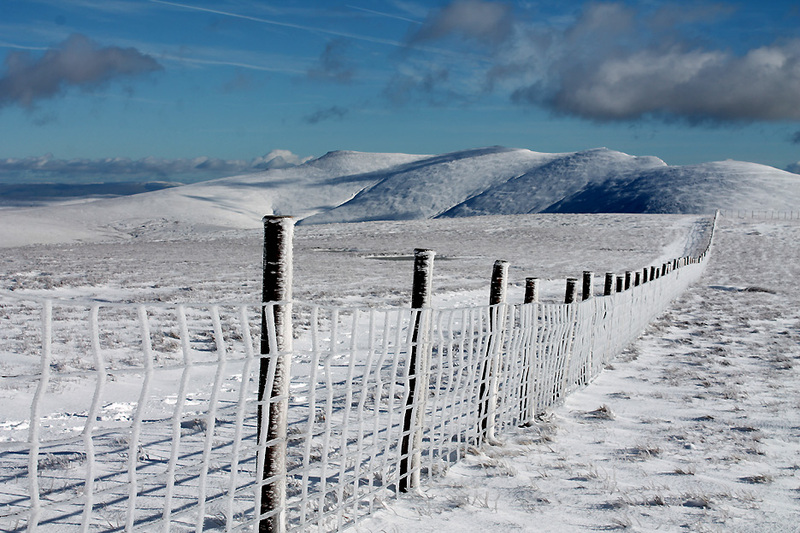 and more snow covered than the southern facing side that most people see from the main A66 road. Looking south, back along the path we've walked. 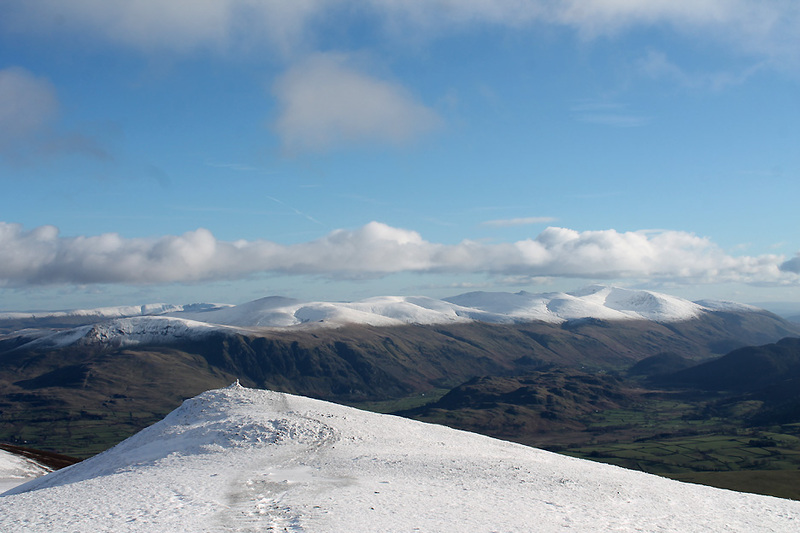 The views extend right the way across to the High Street group of fells in the distance. in fact it adds rather a nice contrast to the bright white of the snow. 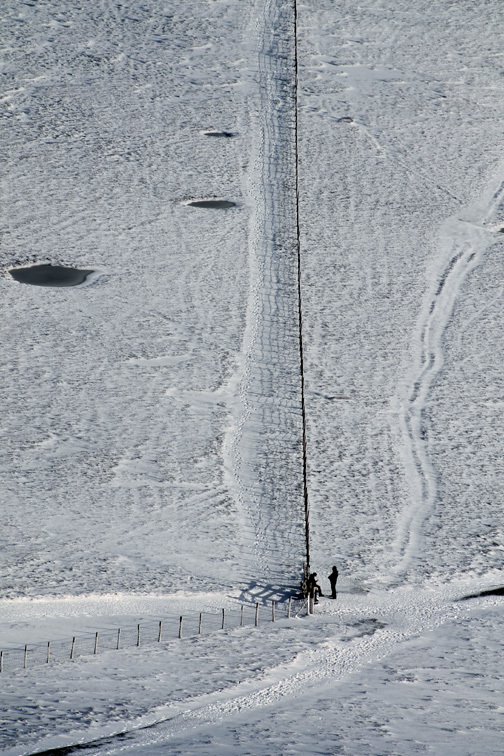 There is a steady stream of people heading up and down the fell but nowhere near as many as on a busy summer day. Lower Man summit from below. 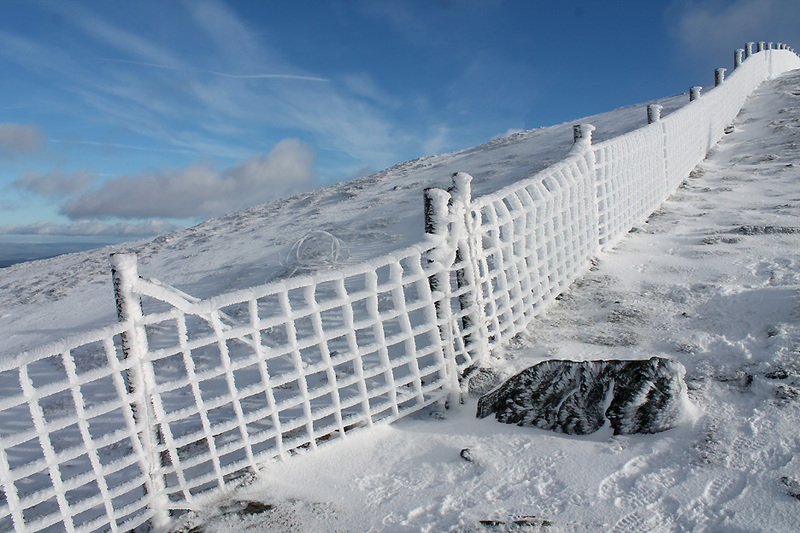 With a northerly wind blowing the back path of the fell is slightly protected. Add to that the effort of climbing uphill and it is warm enough not tonhave coats done up. It will be different on the top ! 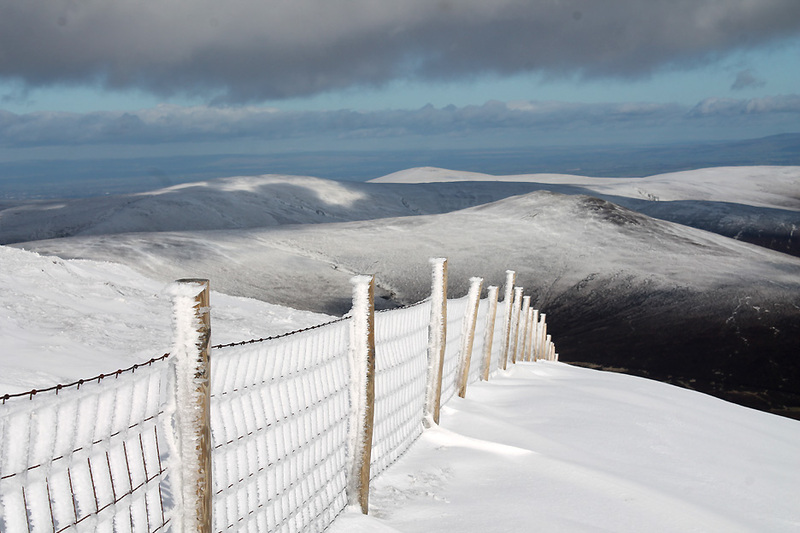 Level now with the Lower Man fence and we can enjoy the views across to the Central Fells once again. The third gate and the final one on the climb to the top. The snow has caught it in an open position and it won't move now till the snow melts. giving it the appearance of waffles strung out on a wire. We met this couple when we got to the gate. 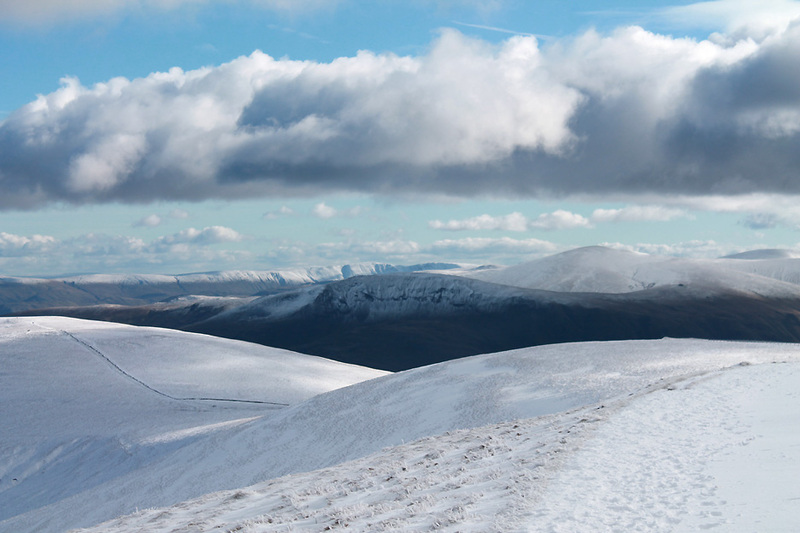 They were obviously delighted to be out on the fells in such lovely conditions too. They pause to rest and recuperate with a cup of tea from their flask . . . but we continued on. We would meet up with them again later in the day. 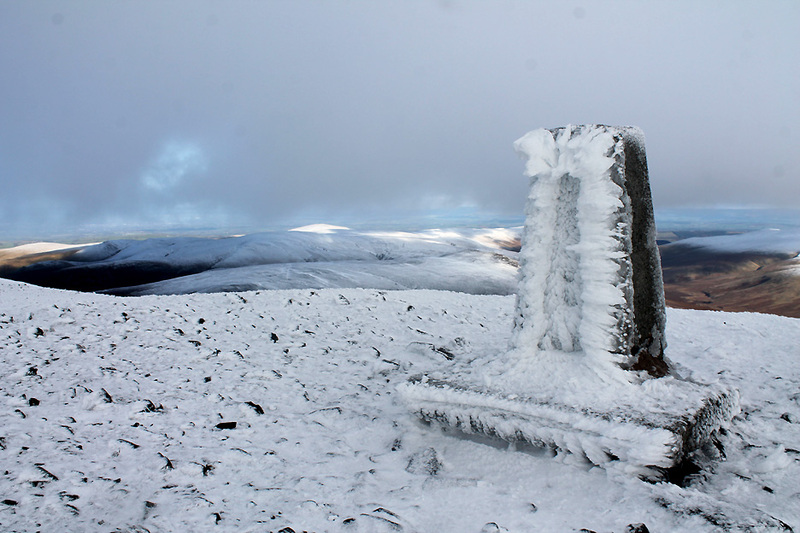 The southernmost summit cairn on the ridge of Skiddaw. 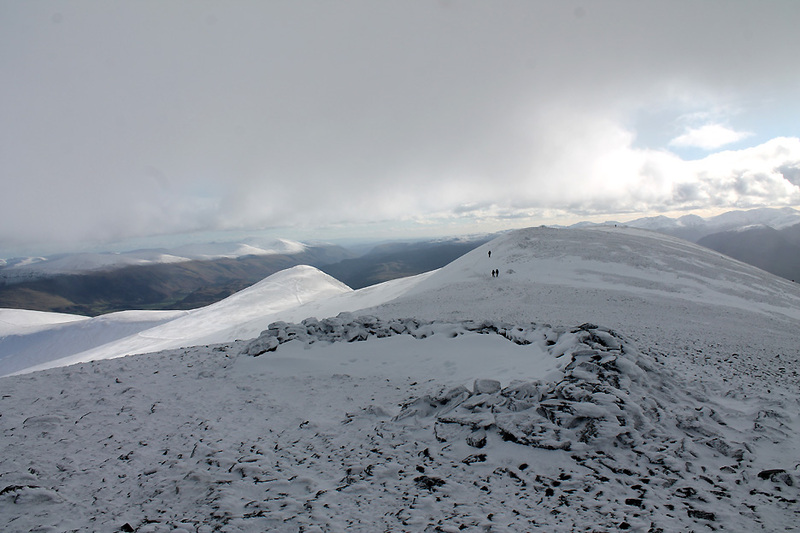 Now in the shadow of that summit cloud and open to the full force of the breeze, the conditions are a lot colder. remains in the form of a thin layer of ice. Everything is a lot more slippery. 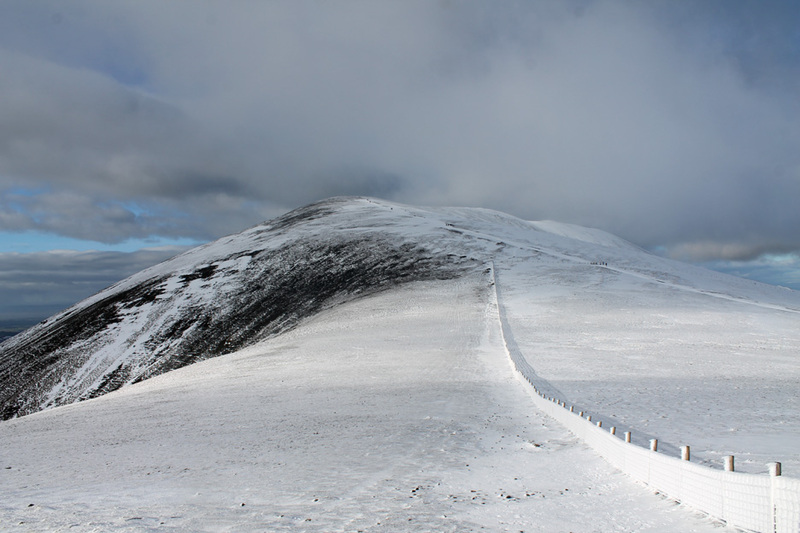 The top of path is made up of loose stones (Skiddaw Slate of course) and traction is still possible, so no need for spikes on the boots at present. 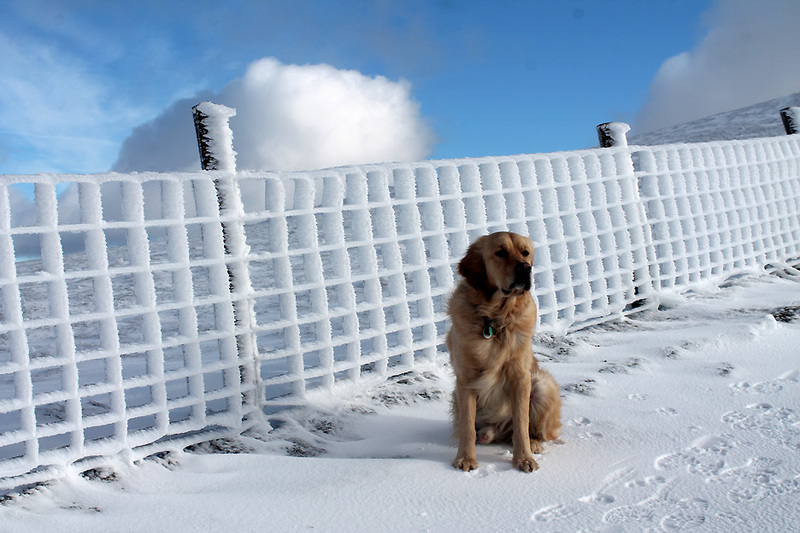 Dylan checks out the first summit shelter for left-over sandwiches. 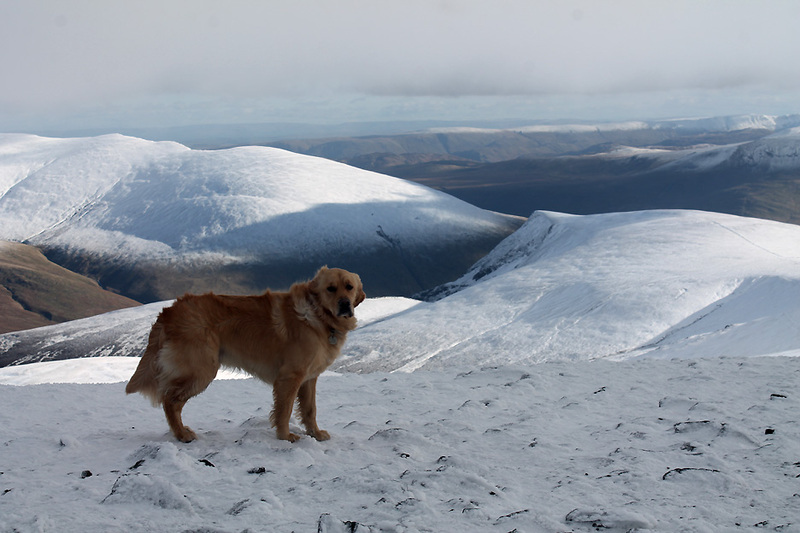 Sorry Dylan, the shelter is full of snow today and no-one would have stopped for lunch up here in this temperature anyway ! We're below the cloud level so the views are superb . 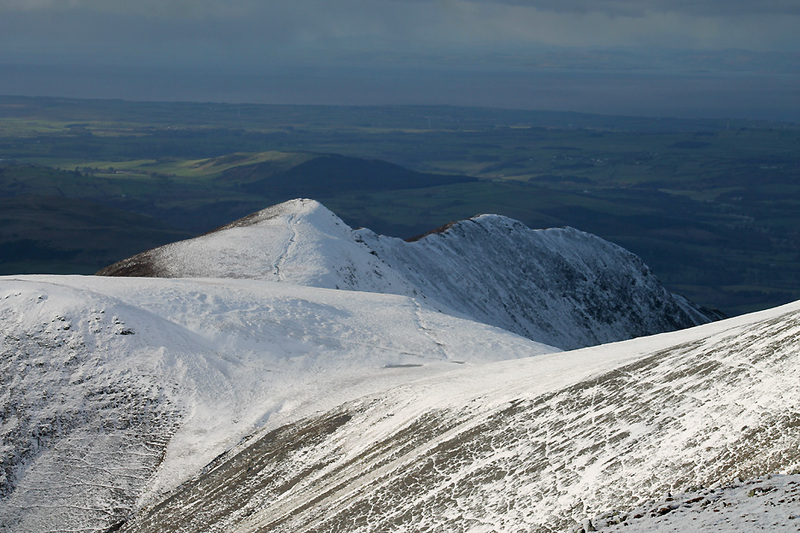 . . Carlside and Ullock Pike below us are positively glistening in the direct sunshine. 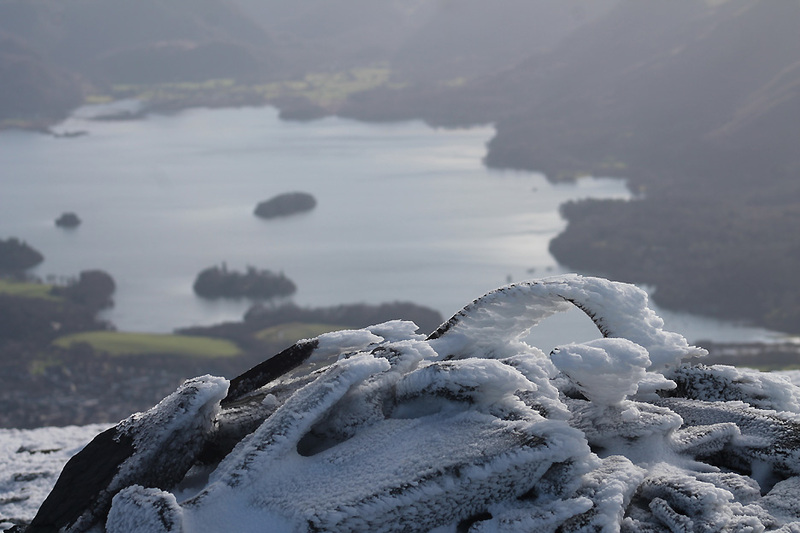 At first we thought the brightness was the sun on Bassenthwaite lake, but that is further down and looking rather grey at the moment. 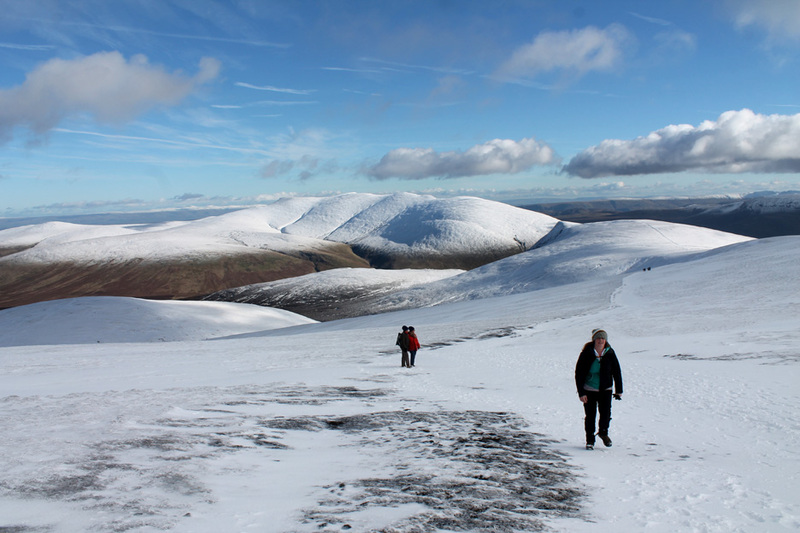 A spring in the step now with the summit in sight. 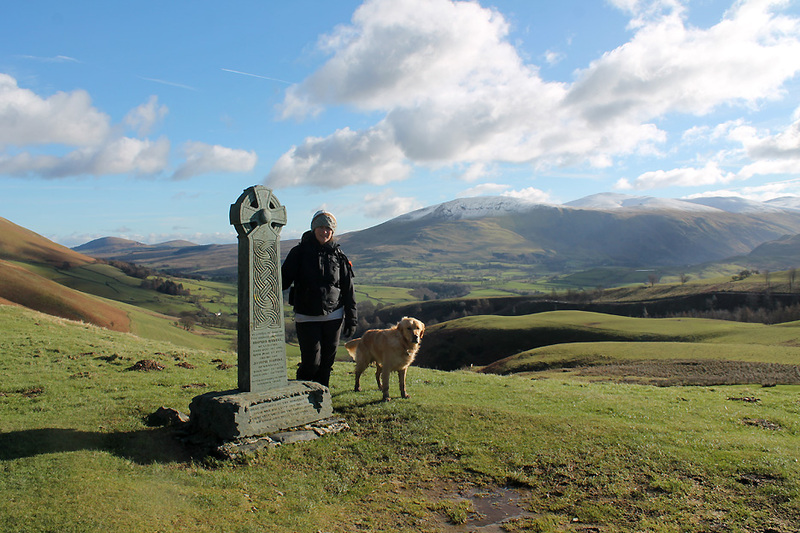 Jenna had forgotten that there are three high points to the ridge of Skiddaw, five if you include Little and Lesser Man. In no time at all we arrive at the final top. We made it . . . and big smiles means someone is very happy indeed ! Time to look around . 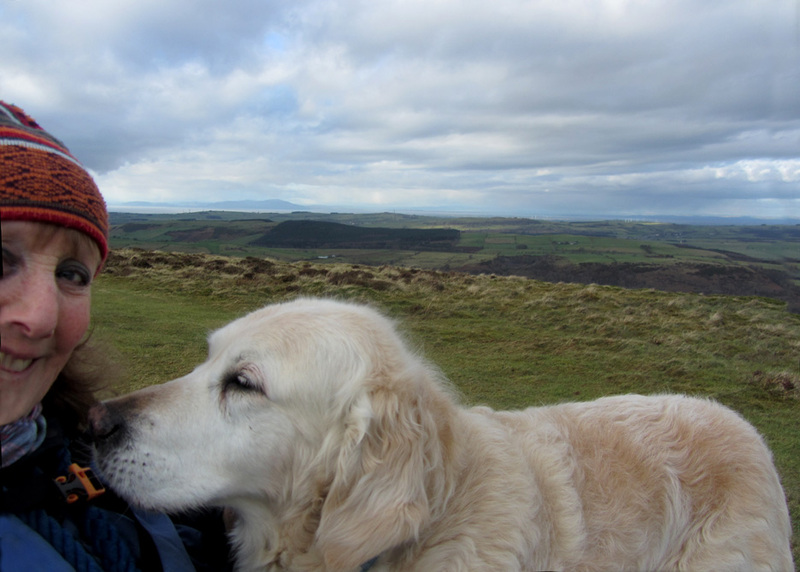 . . with extra layers the wind is quite tolerable and we have time to stop and enjoy the view. 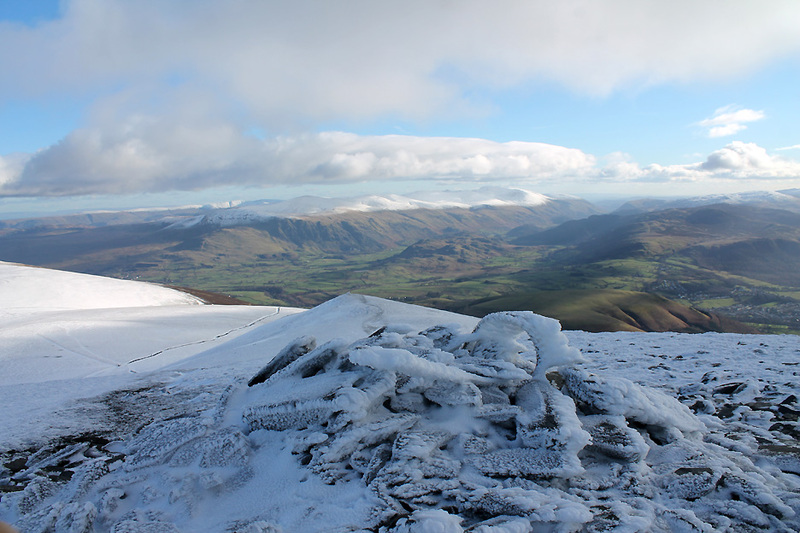 Looking north west from the observation pillar, across Longside Edge to the north western fells. 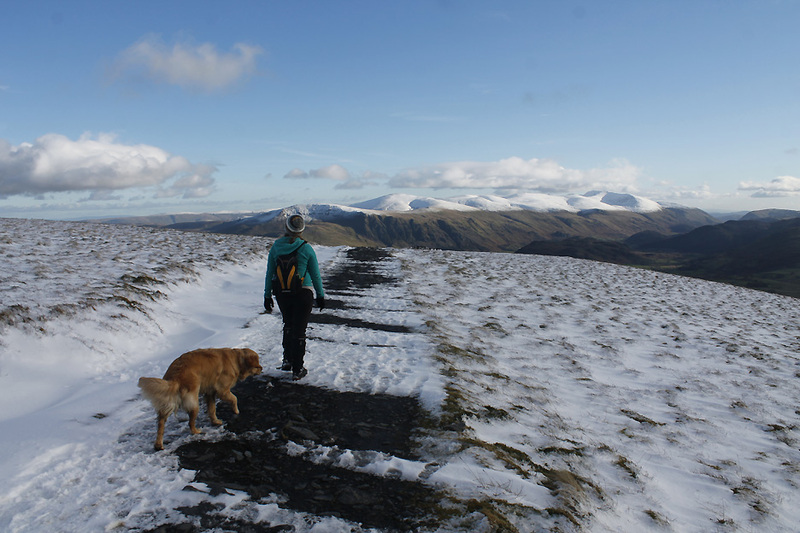 Ann and Harry were on Ling Fell (to the right in the sunshine) about this time. Looking north across Bassenthwaite to the Solway. 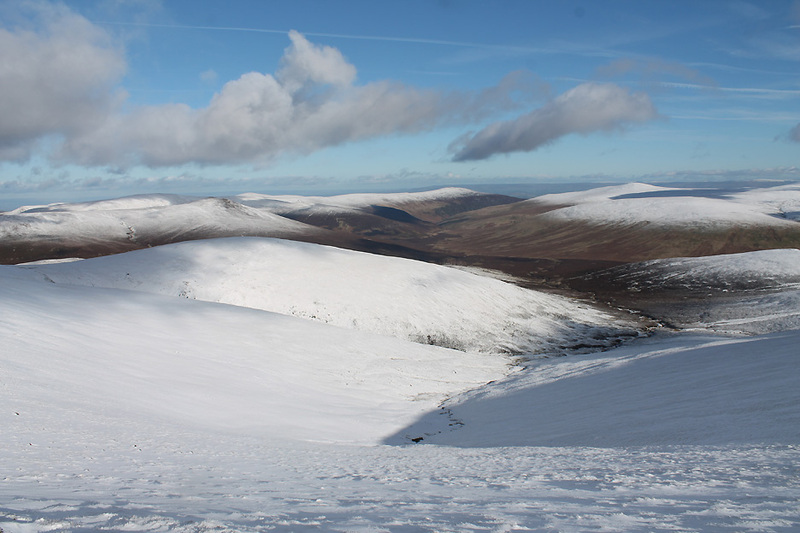 Sale Fell is to the left and Binsey (in the sunshine) to the right. 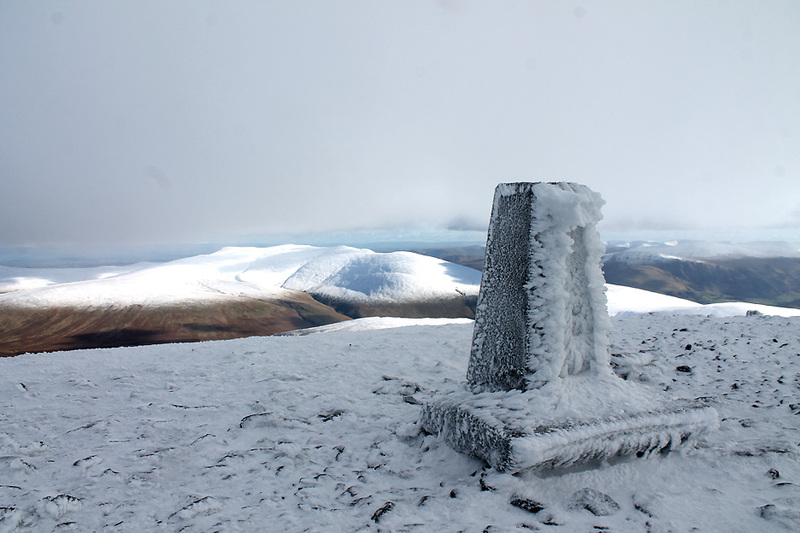 Blencathra behind the trig now as we swing round to the east. 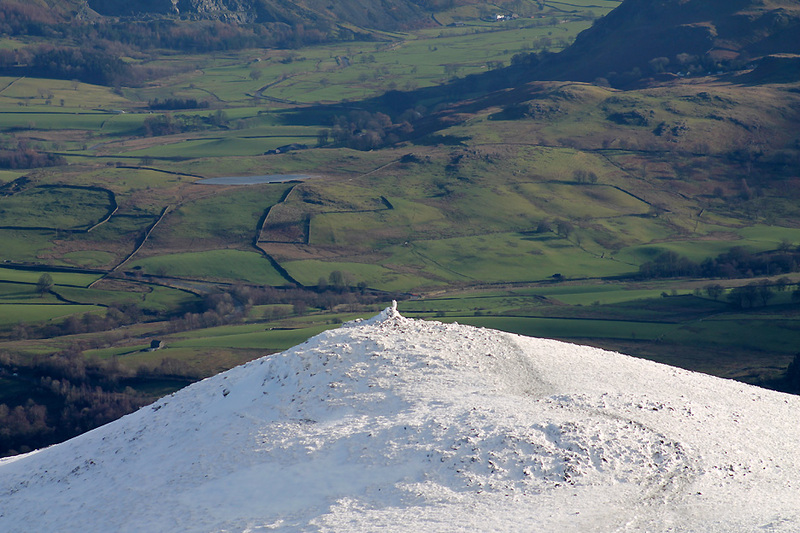 which have been built up from the wind blown sleet and snow of recent days. The kind gentleman who was standing by the observation pillar kindly offered to take our photo at the summit. Much appreciated . . . though Dylan is not looking as happy as we are ! With his fur all puffed up I think he is trying to tell us that it's cold. 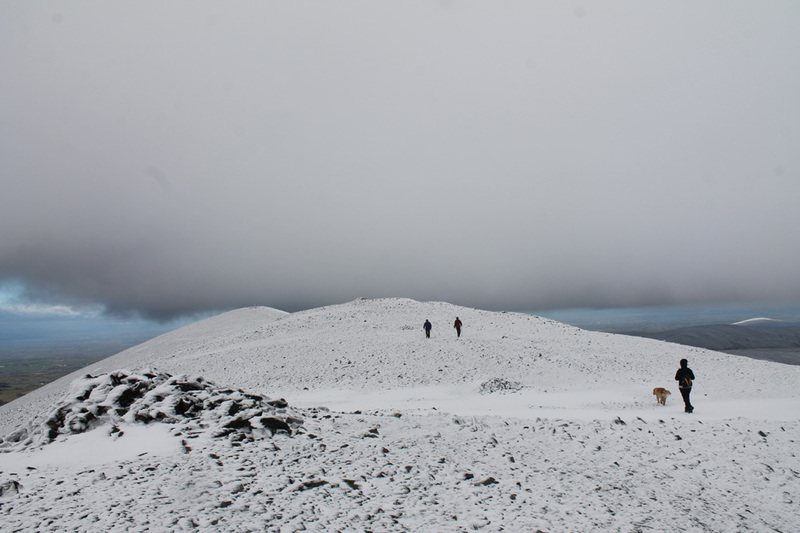 It is amazing that we add all sorts of technical layers, gloves and hats to cope with the conditions but the dogs seem to cope without anything extra. Perhaps if we all grew hairy coats like them life would be very different. Time to retrace our steps along the ridge. 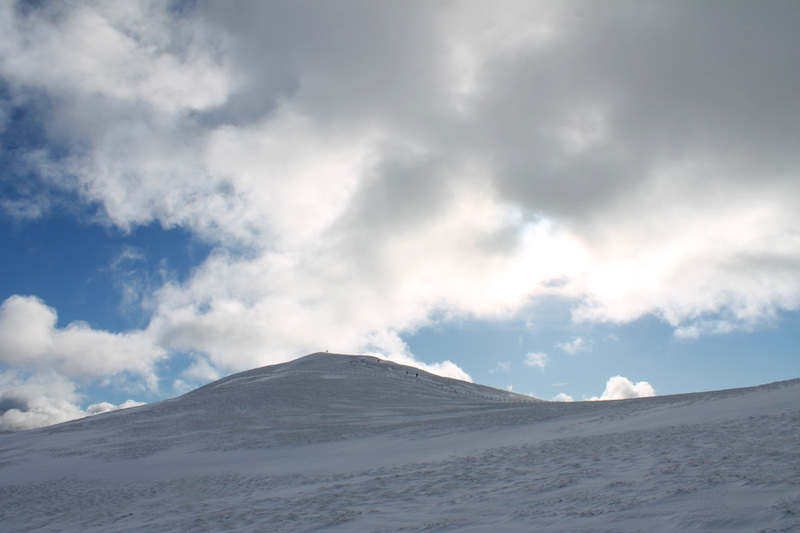 Maybe with a bit of luck the summit cloud will depart and we can get back into that sunshine. Heading back down to the gate once again. 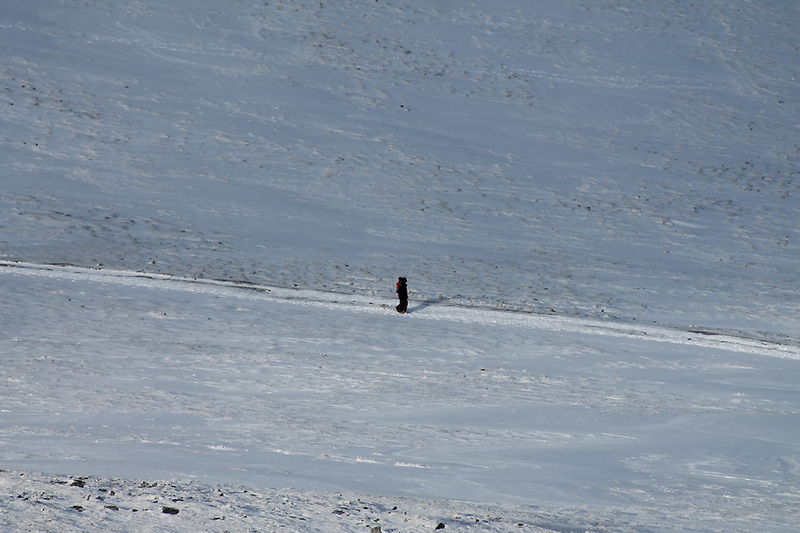 We pass the couple (with the red coat) who have stopped briefly in a small shelter on their way up the fell. 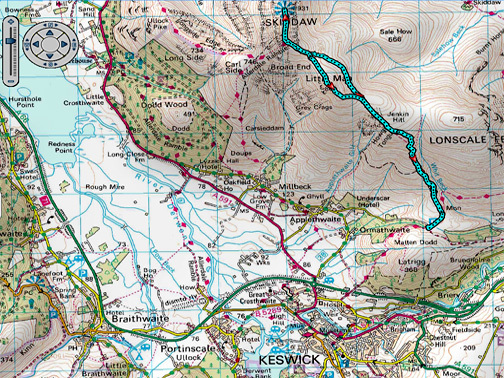 Our route now swings right as we head across to climb Little Man which we passed on the way up. 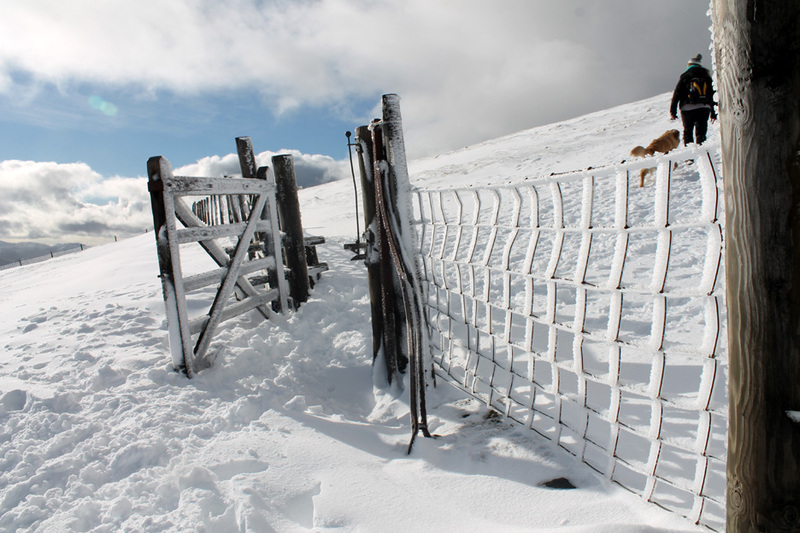 Down to the fence line on the way to our next AW summit. More amazing ice effects on the fencepost. Worth a wider look ! 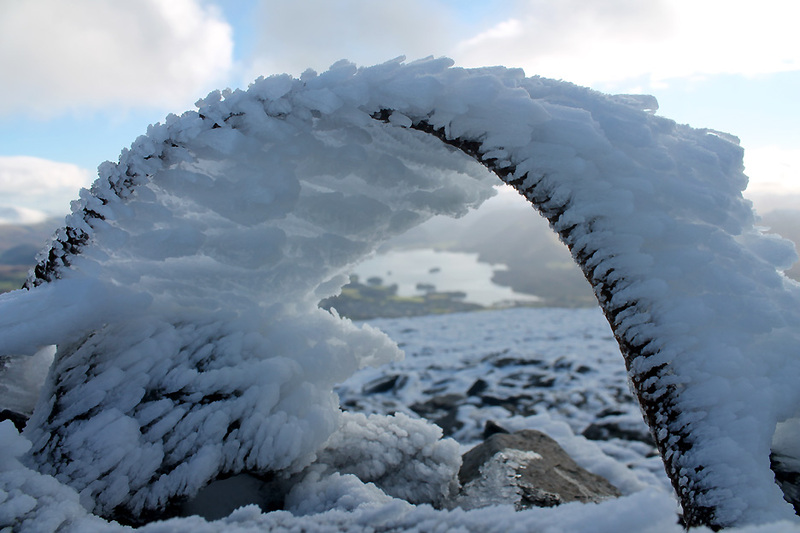 Oh for a little bit of sunshine to brighten up the ice crystals. Nearing the start of the final climb of the day. Looking back as our wish comes true . . . the sun has broken through the cloud.
" It may be sunny but it is still not warm "
We climb along the fence line for a short distance, intrigued by its beauty. It swings away from the summit like the Great Wall of China. 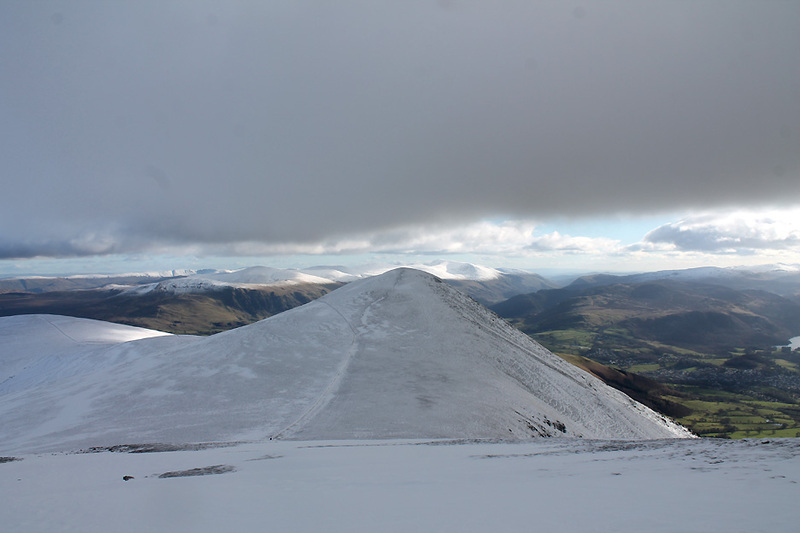 The summit cloud is breaking up and we have one last direct view of Skiddaw as we look back at our route. The snow at our feet contrasts with the green of the valley far below. 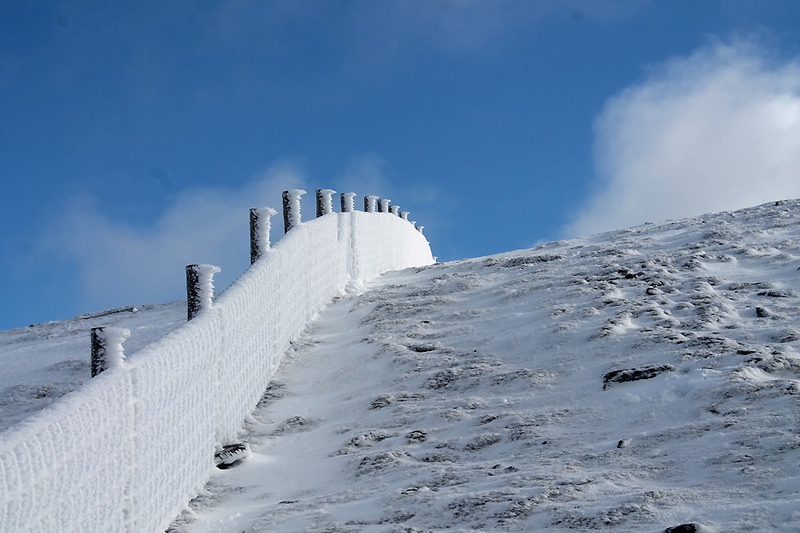 The metal fence posts and wire on the summit are blending in with the stones of the summit cairn of Little Man. I have a soft spot for this fell as it was Ann and my final fell for our first 214 round back in 2001. Getting close up and personal with the ice. 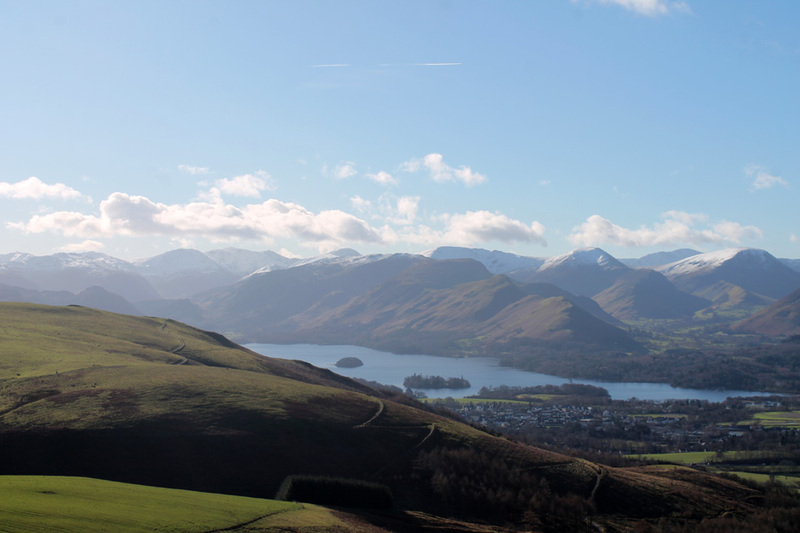 Derwent Water from the summit cairn. 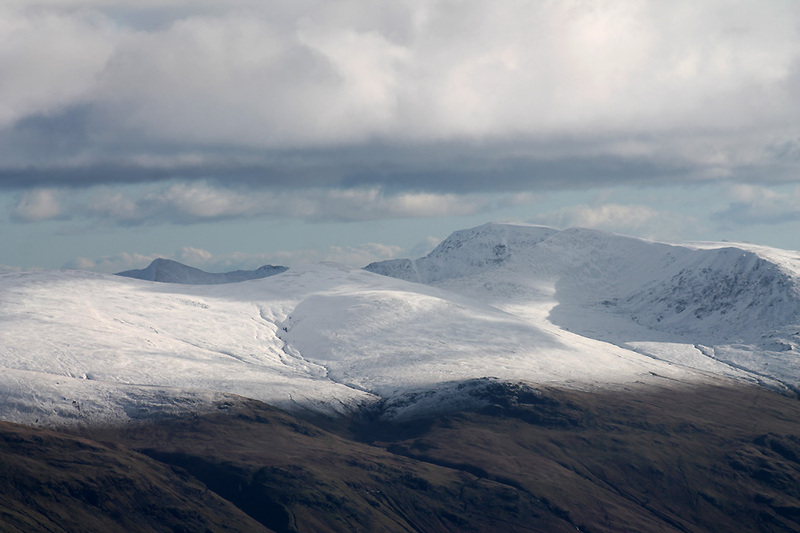 With the bigger lens in place we can look around in detail at the other fells . . . here the final crag beyond Lonscale's flat summit. 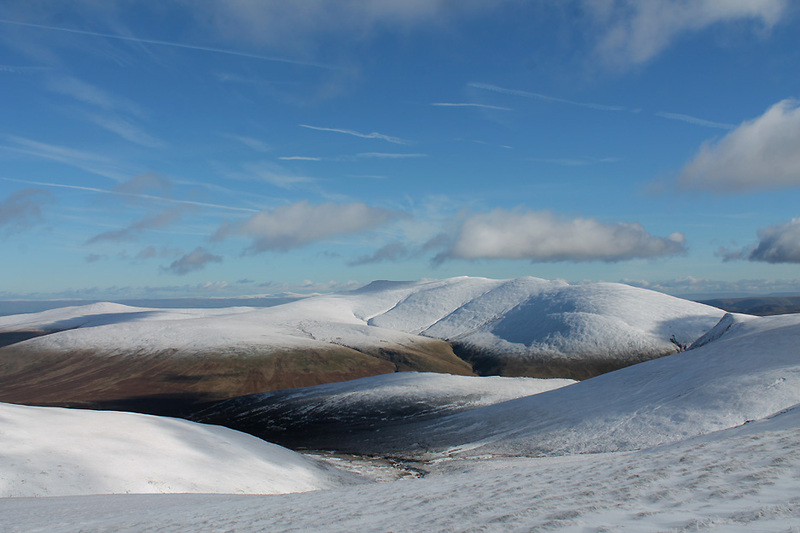 Below us, Skiddaw Lesser Man cairn and distant Tewet Tarn. 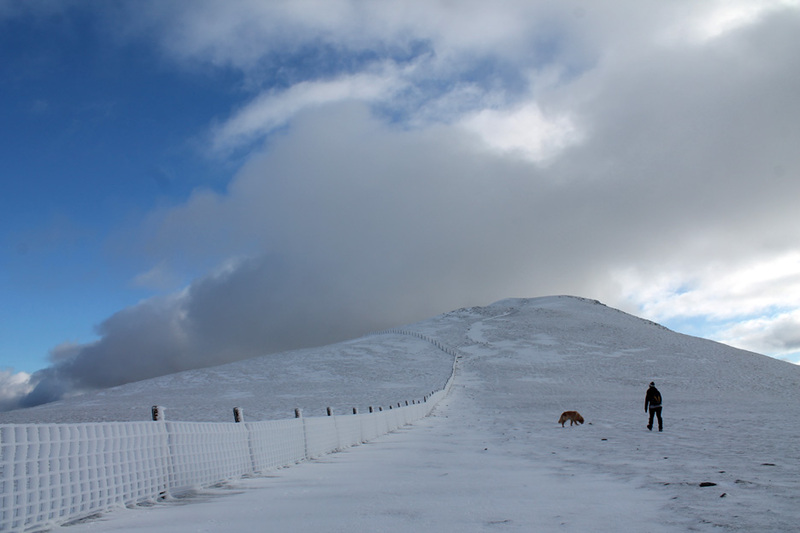 Clough Head and High Street. 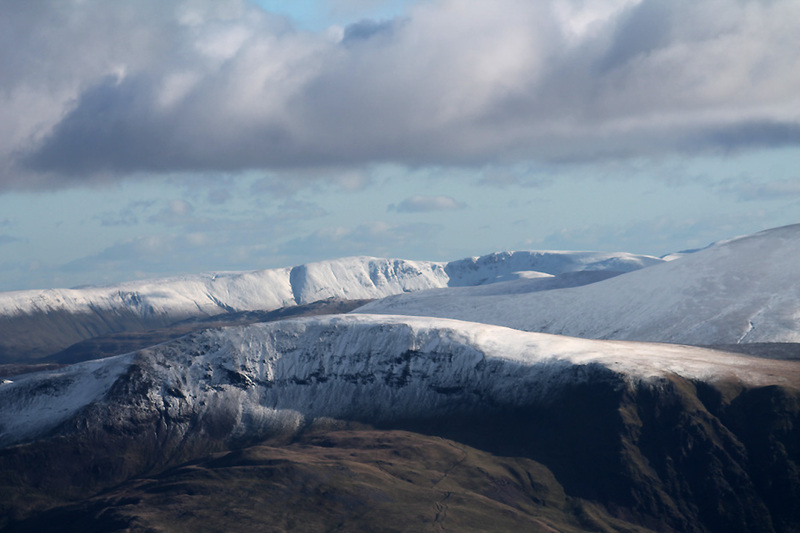 Catstycam, Brown Cove Crags and the summit of Helvellyn. 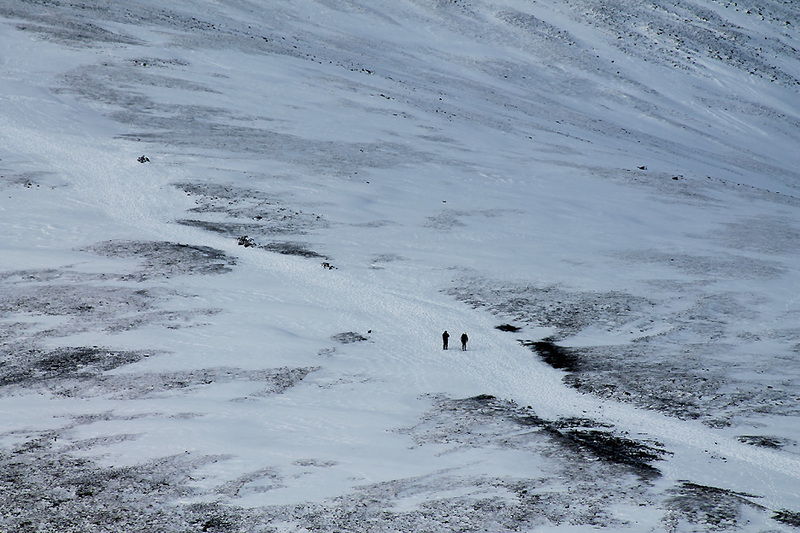 Below us people are making their way back down the snow covered path we used on our ascent. 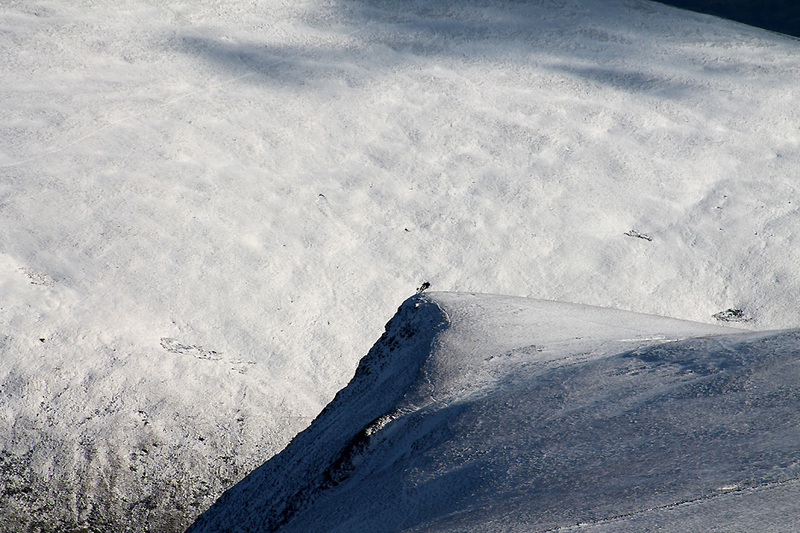 Two small figures on a large expanse of snow covered fell, almost alpine. Do I recognise that red coat again ? We would pass each other a third time at Jenkin Hill gate. 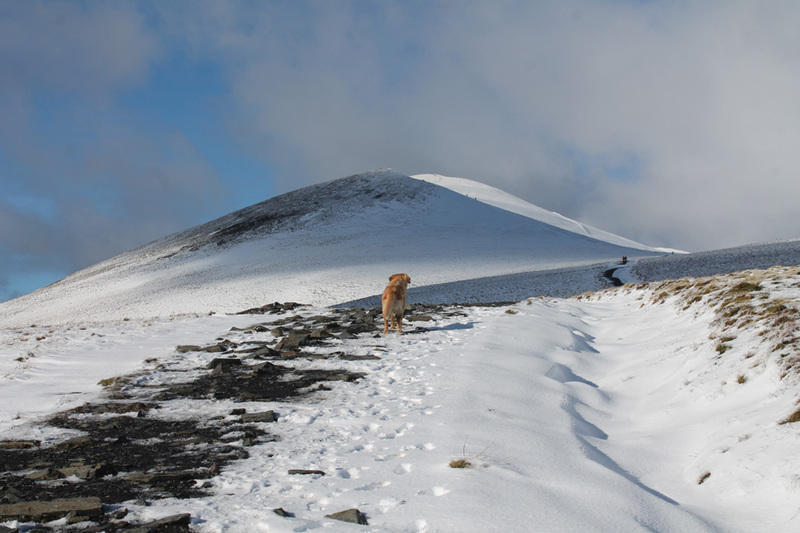 On the edge of the snow line stands Skiddaw House. 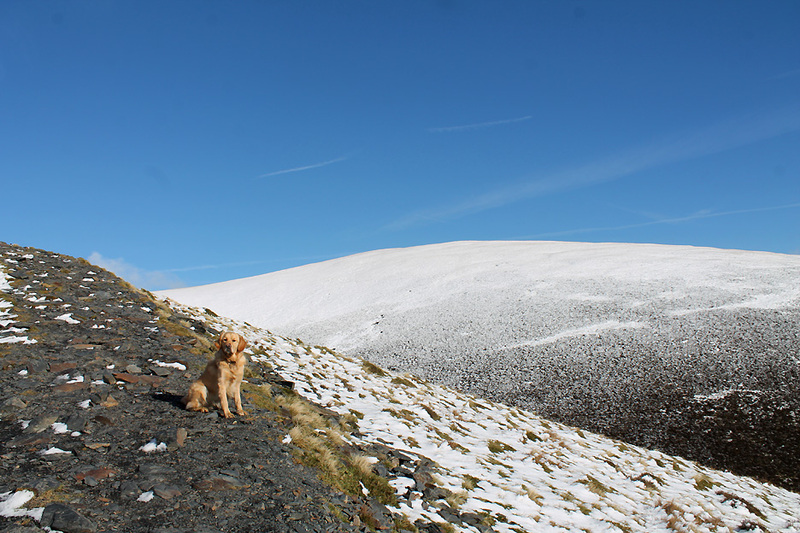 Behind us, the flat white top of Carlside that shone so brightly earlier. 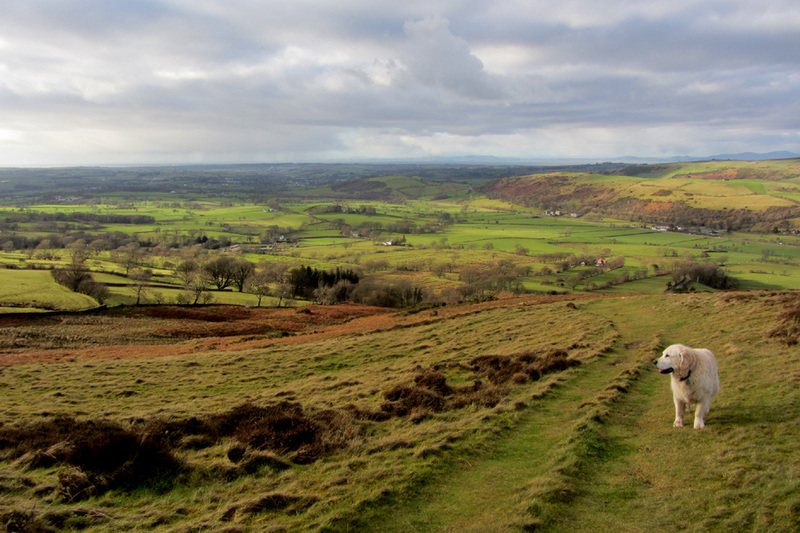 Looking down the wide gully to Carsleddam and beyond to the flat ground of the Derwent Valley. 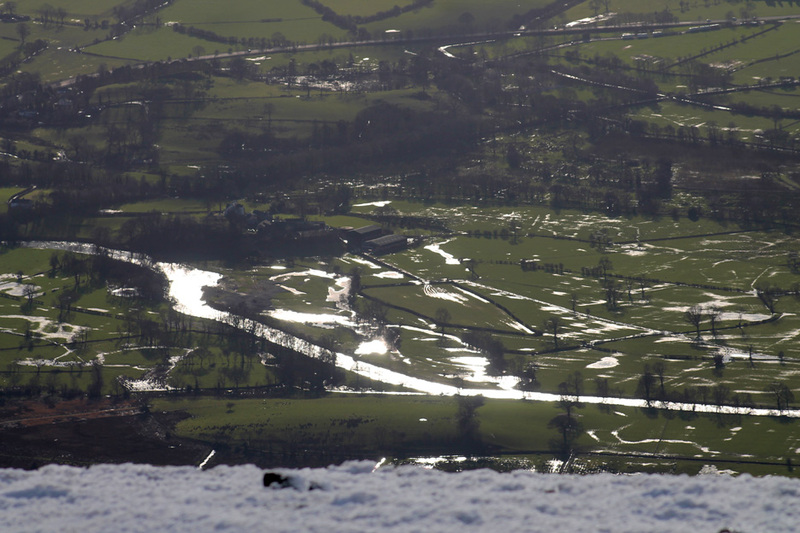 Down at that level the sunshine is reflected in the surface water of recent flooding. 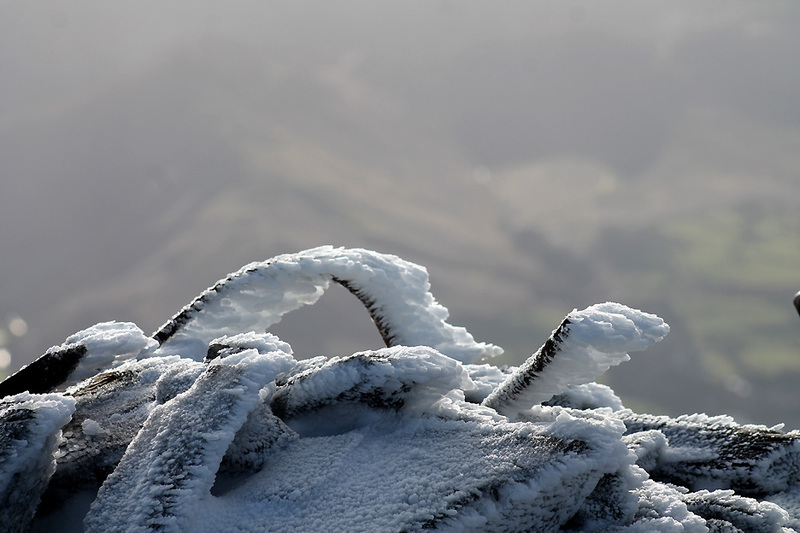 More twisted metal and sculptured ice designs as Jenna stops briefly by the summit of Skiddaw Lesser Man. Then it is onward and downward . 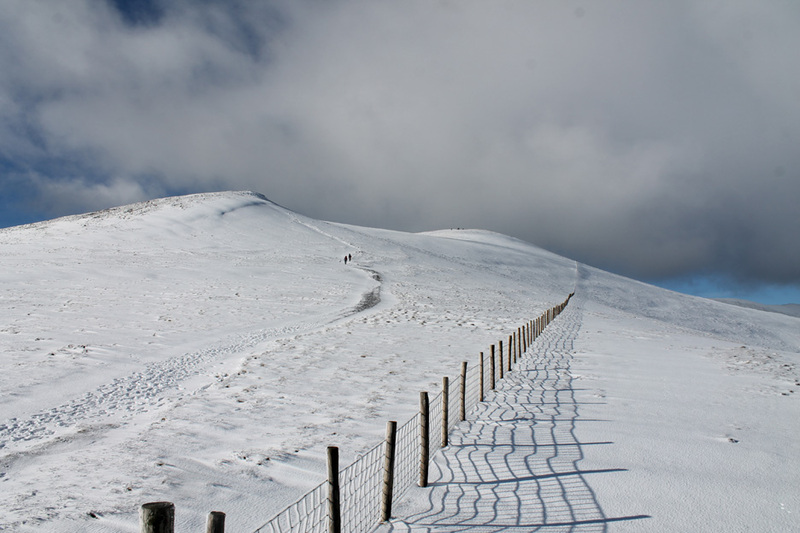 . .
by utilising the deeper snow on the descent. gives a whole different dimension to the scene. Back on the road to home . . . the wide Pony Track route back to Gale Road car park. It seems even steeper in descent than it did when climbing it. The increasing angle, helped only slightly by the zig-zags, can be tough on the knees and calf muscles at times. 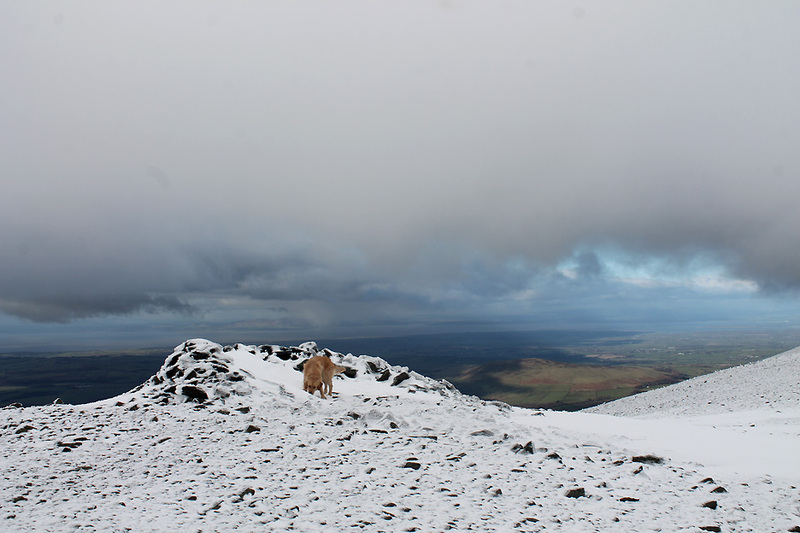 All of a sudden we are below the snow line and the world is back to normal. The greens and browns of winter return and the local sheep, Swaledales and four Herdwicks, search for something nice to eat. Back down via the monument and the car and we've ended a glorious day on the high fells. 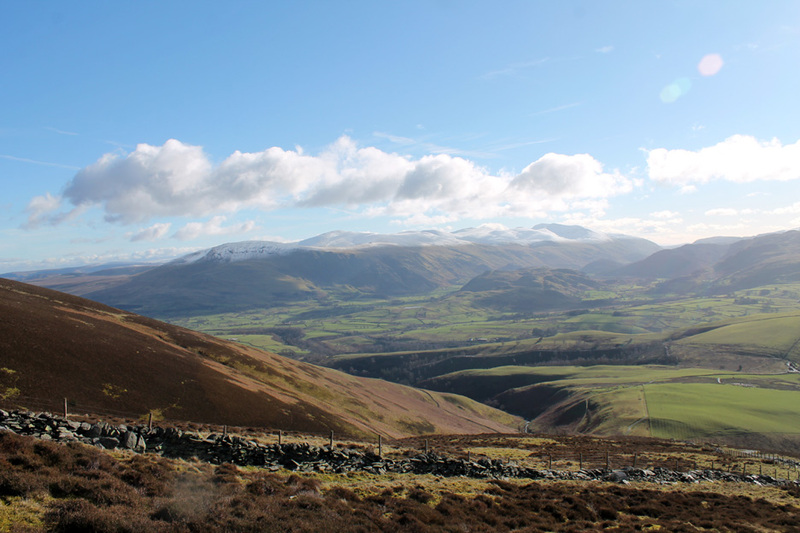 One last look back at Skiddaw from the Knoble Knott viewpoint on Whinlatter Pass as we drive back home. This site best viewed with . . . some proper sunny winter weather. A previous time up here ( it has to be ) - 31st December 2001 New Years Eve 2001 from "Morning to Night "